Rooibos tea – already considered one of the nation’s favourite beverages – has the potential to delay and prevent the onset and progression of type 2 diabetes (T2D), according to a number of recent studies conducted by the SA Medical Research Council (SAMRC) and their research partners, the Agricultural Research Council (ARC, Infruitec-Nietvoorbij, Stellenbosch), the Tokyo University of Agriculture and Technology, the Polytechnic University of Marche based in Italy and the National Health Research Institutes in Taiwan. Prof Christo Muller, Chief Specialist Scientist at the SAMRC, who has led a number of research projects focusing on the effectiveness of Rooibos in the treatment of T2D, confirms Rooibos’ potential to help control diabetes, in conjunction with healthy lifestyle changes. “Diabetes is amongst the most prevalent diseases of lifestyle of our time, with about one in 14 South Africans between the ages of 21 and 79 suffering from the condition. Many are also unaware that they have diabetes and are living with dangerously high blood sugar levels, increasing the likelihood of developing diabetic complications such as blindness, renal failure, amputation, heart attack and stroke, which is a frightening outlook. “Our research found that an aspalathin-enriched extract of green Rooibos effectively lowered raised blood glucose levels in diabetic rats. 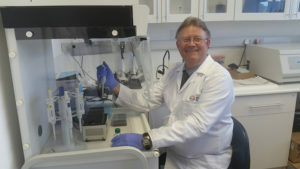 Aspalathin is a unique phenolic compound (an element produced by the plant to help protect itself from negative environmental factors), found only in the Rooibos plant (Aspalathus linearis), which has been shown to contribute significantly to the biological benefits of Rooibos,” explains Prof Muller. Other research at the SAMRC also show promising cardio-protective benefits of aspalathin in a diabetic heart model. In a more recent study, just completed by Prof Muller and his team of researchers, Rooibos extract achieved significant glucose-lowering results in diabetic non-human primates, which has been described as a breakthrough discovery. These results will be published next year. Human trials have been earmarked for 2018. Prof Muller says that studies conducted on the health properties of Rooibos by the SAMRC and ARC, including those done in overseas laboratories, span more than 10 years’ worth of intensive work and points to the feasibility of developing a Rooibos-based anti-diabetic nutraceutical. “Such a product could be of tremendous value to diabetics given that It could reduce the risk of some side-effects of traditional pharmacological treatments that are currently on the market. The domestic agricultural sector also stands to benefit since SA is currently the sole exporter of Rooibos. The plant grows exclusively in the Cederberg region situated in the northern part of the Western Cape. “Rooibos is a unique South African plant, which offers almost limitless health benefits. The plant’s medicinal properties continue to astound scientists. I believe we’ve only just scratched the surface of Rooibos’ incredible healing potential,” he remarks. For delicious diabetic-friendly recipes that include Rooibos tea, visit www.cookingfromtheheart.co.za – a healthy cookbook series funded by Pharma Dynamics and endorsed by the National Department of Health, the Heart and Stroke Foundation SA and the Centre for Diabetes and Endocrinology. Mix the coconut into the milk and allow to stand. Heat the oil in a large pot over a medium heat and fry onions, carrots and baby marrows for a few minutes. Add spices and butternut and fry until aromatic. Reduce the heat and stir in the tea or water with the chilli. Simmer with the lid for 20 minutes or until the veggies are just cooked. Add beans, tuna with the liquid, coconut with the milk and salt. Simmer for another 5 minutes or until heated through. Season with lemon juice and pepper. Stir in chopped coriander and garnish with more fresh leaves. Serve in bowls with slices of avocado. This dish has enough carbs to fill you up, so it is not necessary to serve with more carbs. Enjoy with a green salad. If preferred, add another 50-100 ml milk with the coconut for a saucier hot pot. Heat the oil in a large pot and fry chicken until brown. Spoon out. In the same pot, fry onions, carrots, celery and baby marrows until brown. Add chicken, tea, water, rosemary, bay leaves, barley and salt. Reduce the heat. Simmer with a lid for about 20 minutes or until the chicken is cooked. Spoon out the chicken. Cook the soup for about 40-45 minutes or until the barely is soft. Meanwhile, debone chicken and shred the meat. Add back to the soup once the barley is cooked. Season well with lemon juice and pepper. Stir in the parsley and serve hot. Serve this soup on its own and don’t be tempted to make bread part of this meal. The barely has enough carbs to make it filling. Rather bulk up by adding more green veggies to the soup if preferred – broccoli or spinach will be delicious. Avocado is also delicious served with this soup.